Friday night was our annual, local Glow Run 5k. I ran tis race lady year just a week after my first Half Marathon. 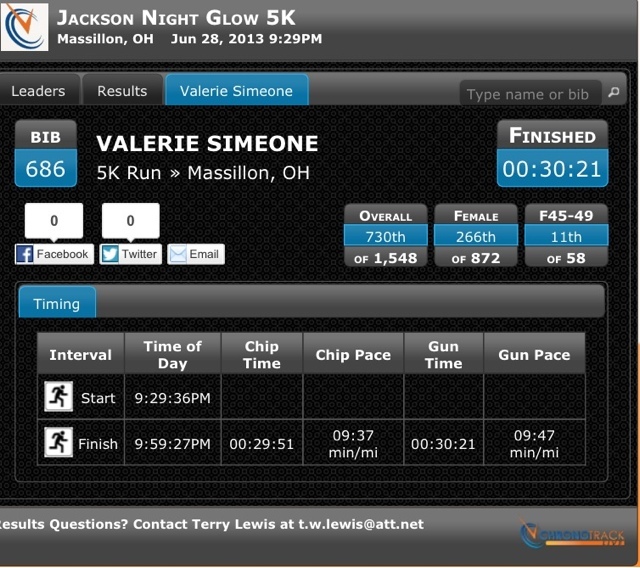 I had a hard time with it because I had been doing so many long runs that I really didn't know how to pace for a 5k. I did MUCH better this year! This isn't officially a PR but I'm tempted to count it because the race where I got my PR did not measure 3.1 miles. It was short and my pace was faster during this race! This week is going to be tough to fit in some workouts. We have the odd holiday in the middle of the week which includes a 5 mile race. I'd like to get in a good run or steps workout before Thursday. To complicate things, I work the "late shift" this week which means I don't get off work till 6pm. Saturday: ugh-who knows! I'm afraid nothing since we are hosting a big picnic! Hopefully, I can have everything together the night before and I can get up early enough to get in a couple miles. How do you work in training during busy weeks? I never seem to have anything prolific to share! 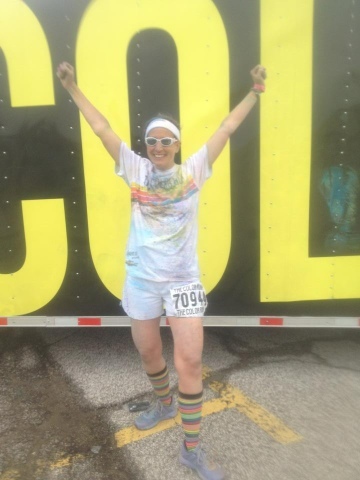 While there hasn't been anything earth shattering, my friend, Amanda, and I ran a Color Run last week. It was so fun! It was an hour's drive but we went up the Thursday before to pick up our packet and make a stop at the nearest Trader Joes to us. That bought us a little extra time on Saturday morning. We didn't have to leave until about 5:45. That is LATE compared to getting up at 2am for the Disney Princess Half! Oddly enough, when I stopped to get gas at 5:30am, the only other person at the gas station also had on a Color Run shirt! I 'm embarrassed that I was too delirious to make conversation. Amanda is on vacation this week so I am on my own for runs. I'm hoping to get in a mid-week 5 to 6 miler and I'd also like to get down to the monument for some steps. I need some extra workouts since I had a HORRIBLE food day today: stuffed French toast for breakfast and I just had a mint Oreo blizzard for an after dinner treat. I promise to get back on track (literally) this week! I hope you have a wonderful week and keep on YOUR track!